SCOTTSDALE, Ariz. – Nov. 27, 2018 – Barrett-Jackson will help fuel the desire for high quality and professionally built hot rods and Resto-Mods at its 48th Annual Scottsdale Auction, January 12-20, 2019, at WestWorld of Scottsdale. From high-profile hot rods like “Twisted Mistress,” a ’31 Ford Model A Custom Coupe (preview), to other beautifully hand-crafted customs such as a ’39 Mercury 99A convertible (preview), the Scottsdale Auction will be an exciting opener for the 2019 collector car auction season. Hot rods and Resto-Mods scheduled to cross Barrett-Jackson’s Scottsdale Auction block include “X-Box,” a ’55 Chevrolet 210 Sedan (preview) that combines modern-day power with yesterday’s classic looks. 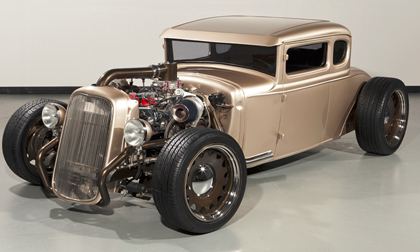 Built on a Max-G Art Morrison chassis, this custom is part of the Bryan Frank Collection and is the product of over 100 modifications made over 6,000 hours. “Transitions” is a ’54 Corvette (preview) built by Larry Griffey’s Hot Rods & Restorations. It is a tribute to the GM Concept Corvette displayed as one of the “Dream Cars” in the 1954 GM Motorama. Built over six years, it debuted at the 2017 Detroit Autorama and has been the recipient of countless awards. Highly anticipated truck-based Resto-Mods include a ’67 Chevrolet C10 (preview) that was the 2018 Goodguys pick for best truck. Custom-built from top to bottom, this truck rides on Fox nitrogen shocks and is powered by a 383ci stroker engine with roller cam and roller rockers mated to a Turbo 350 automatic transmission. Discovery’s Diesel Brothers hand-built this C10 (Lot #1309) on Season Three over three episodes. Shaved and molded to perfection, this custom truck is powered by a Twin-Turbo Duramax diesel 6.6-liter race engine. Producing an estimated 800 to 1,000 horsepower, this custom is as fast as it is beautiful.